I'm obsessed with romantic comedies. And I lament the fact that — in our day and age — there are no summer blockbuster rom-coms like there were ten years ago. Instead, we get big-budget superhero action flicks, and sometimes if we are very lucky, we get films about two different superheroes fighting one another. Perhaps it's because love has become formulaic that writers don't know how to make it interesting and relevant. Perhaps it's because the predictability of these movies lends them to Redbox or Netflix and not cinemas. But whatever the case, the rom-com has been suffering for a while now (so much so that creators like Liz Meriwether have written thousands of words about it), in film and in television. Shows billed as rom-coms like Selfie, (the cringe-worthy) Manhattan Love Story, and The Mindy Project have been cancelled (and in one case, revived) in recent years, while shows currently on television teeter on the line of rom-com (You're the Worst, Crazy Ex-Girlfriend and New Girl aren't really rom-coms in a traditional sense since they're more about the female leads exploring who they are, not who they love). But there's a new player in town, vying for the title of "television's cutest possible apocalyptic-themed rom-com" and that show is No Tomorrow. 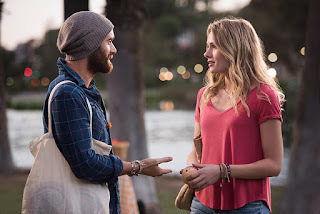 I loved Joshua Sasse on Galavant (R.I.P., you quirky musical comedy) and when I began to see trailers for No Tomorrow, I became tentatively excited. It looked exactly like the kind of comedy I get drawn to — understated, deeply human, with characters who find funny in the ordinary. No Tomorrow is a show about a young woman named Evia (Tori Anderson) who is exactly the same as me when it comes to life: she approaches it with deep caution and organization, choosing to plan and take logical leaps (or as a character from New Girl would say: "small, planned steps like an arthritic dog"). She's currently taking a break from her quiet boyfriend, Timothy, who her family adores but who Evie feels no real spark with. But then she meets Xavier (Joshua Sasse), a charming and attractive man at the farmer's market and Evie does what most of us do: projects every romantic hope onto him. When fate sends a package meant to Xavier to Evie's door, she returns it to him and learns more about him — specifically that he lives in a home filled with things you might find in a SkyMall catalog and has no job. And when Evie asks what he does and why... well, she gets more than she bargains for. You see, Xavier believes that the world has eight months or so left in existence and that an asteroid will strike, causing the end of humanity as we know it. He's done the math and science, and tried to warn others. But no one seems to believe him. And Evie doesn't either. He has to be crazy, right? To live like the world is ending is one thing; to believe it is, is another entirely. But what I love so much about No Tomorrow already is that it's grounded in the reality that everyone is a little weird. We all have beliefs and theories and our own personal opinions about things that make us sound crazy to other people. (Evie's coworker and good friend thinks that the Russians will cause the end of the world and has an entire drawer of preservative-filled candies in case of the apocalypse, for instance.) And while his methods are unorthodox, the sentiment behind Xavier's statements and actions is not — he wants people to actually LIVE, not to just exist. We were meant to do more than just shuffle through okay jobs, mundane lives, and routines. If we have desires and dreams, we should live them out and fulfill them. Evie has never had anyone (I suspect, since we don't know much about her backstory yet) really push her and encourage her to go for the unstable over the stable. Her mother and sister are well-meaning, but they really just want Evie to ultimately be content and happy in the way they define happiness. Evie is much more prone to doing that — if Xavier hadn't come into her life when he did, she probably would have accepted the proposal from Timothy. But she doesn't. And it's not because she has feelings for Xavier at that point (though she does), but because she actually begins to think about her future as something real and not a vague and uncertain future. Speaking of Xavier and Evie, the two actors who play them have incredible chemistry already. I mean, in all fairness, Joshua Sasse could have chemistry with a rock and I'm sure it would swoon at him. But Tori Anderson is just fantastic as Evie. The young woman is awkward, meek, and even-tempered. She's content to be content, even if that means she just coasts. And Xavier challenges her. He's free, loose, and unafraid to speak his mind. Together, the two are already dynamic. And I think it's because the best relationships challenge one another — he encourages her to pursue dreams and not just settle for what's in front of her; she tells him off, insisting that she will make her own decisions in life. He may be her gentle nudge, but Evie makes it clear in the pilot that she is the one calling the shots. Amid the cute and quirky comedy, we also had a really unexpected twist: Evie gets injured in an accident (thanks, indirectly, to Xavier) and when she's admitted to the hospital, the doctors discover that she has a heart defect that requires surgery. Xavier saves her life, and — as a thank-you for him accidentally doing that — Evie has decided to live her life. Her steps aren't drastic ones like Xavier's: she doesn't quit her job and start handing out pamphlets about the end of the world. I don't even know if Evie believes what Xavier does about the apocalypse. But what is most important and what she does learn is that life is meant to be lived, not just settled for. This series could be a really cool romantic comedy with two people trying to learn how to live in a world that just tells us to be practical. Xavier has a book — a lot different than the one Oliver Queen had in Arrow's first season — filled with things he wants to do before the world ends. Some of them are simplistic and selfish; others are profound and will be difficult to accomplish. But they're all important to him in some way. And as Evie and Xavier begin this journey together, I'm excited to see what Evie will add to her own book (adorably titled, by Xavier, "apocalyst"). No Tomorrow is unlike any comedy this season. It's quirky and cute, fun and flirtatious — with a twist of weird — and the kind of romantic comedy that I have desperately wanted to see on television. I didn’t want to watch this show because I've watched the original series on which it’s based, but after I read your post I may check out! I love rom-com too and it's a shame that each year we are losing ground to these kinds of movie / series in Hollywood. I started watching Kdrama to fill that void and is works so well, every time I'm in the mood to sit on the couch, just eating popcorn and relax and just watching a Kdrama rom-com. If you miss rom-com, maybe you should take a given try.